We all have a favorite local shop. It could be because of the selection, it could be the atmosphere, it could be because everybody knows your name. It’s the shop we call “home”, because we just might spend more time there than we do at home. A game shop is one of those rare retail establishments where, if you’re a regular customer, not only do you know the proprietor, but you also know a good portion of the customers. Any smart game shopkeep will tell you, it’s not just about having the product, or the game space, it’s about the community. For a bit, now, the Northwest side of Indianapolis has been without community. For gamers in that area, they’ve had to travel to Avon or Broadripple to find their closest game shops. However, that has all changed. 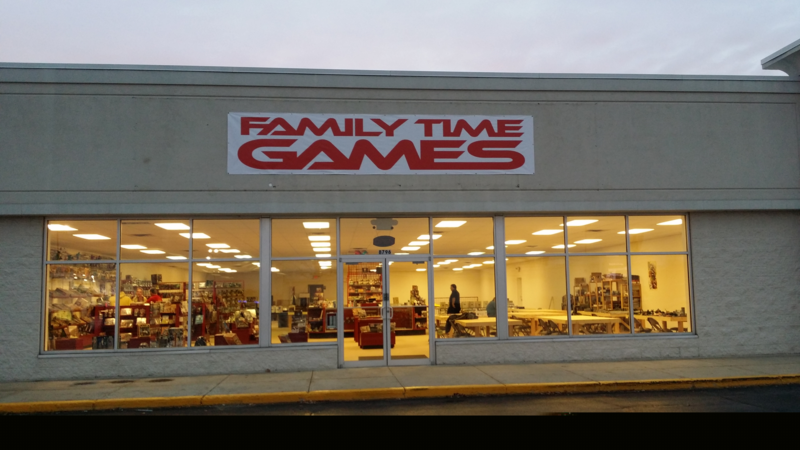 On Saturday, November 7th, Family Time Games opened up on Michigan Road, between 86th Street and 465. 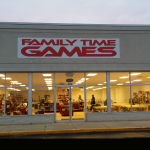 Family Time Games is a store specializing in tabletop games: board, role playing, miniature, and collectible card. They also carry comic books, with long boxes full of back issues, as well as a selection of action figures based on fantasy and gaming, like Shadowrun action figures. Walking in, you notice they have a LOT of space, and the back third of the store is unfinished. That’s because they’re still opening, and they have big plans for that area, but that’ll come in the future. Spoilers: Like coffee? For right now, they have all the trappings of a great game store. They have game tables, which they have built themselves. They have terrain for miniature gaming. They have a good selection of board games, as well as miniatures for Heroclix, Star Wars, Star Trek, and others. They have a demo library that has a decent amount of games right now, and they are planning on growing as the store stays open. Also, as I said, they have long boxes of comics that I’m kinda itching to go digging through sometime in here. The owner of Family Time Games is Shane Priddy. He is a huge advocate of using games to bring family together. You have to admit, being a father of seven, he has some experience at this! This is why he calls the store “Family Time” Games, because games are a great way to get your family to unplug, sit down together, and spend time together. He also recognizes that “family” doesn’t just mean blood relations, but also those you care about and spend your time with, and he wants to help your family stay close by recommending great games for you. Family Time Games had a great vibe when I walked in, and they’re not even 100% set up, yet! You should check them out, and welcome them to the neighborhood! What are they? A friendly local game shop, specializing in board, miniature, and role playing games. They also sell toys and some comic books. Just kidding on the phone number! Internet! Where are they online? Of course, they have a website, and you can also keep track of their happenings via their Facebook Page, as well as their Twitter feed! I strongly encourage any Gamers and Geeks on the northwest side of Indianapolis to check them out! Let them know Geeking in Indiana sent you, because they’re always curious about how people found out about them! Here’s some shots of their (still a work in progress) location, to help whet your appetite! I went in this week, and in addition to the cafe, they’re also going to have a toddler play area. “For a bit, now, the Northwest side of Indianapolis has been without community. For gamers in that area, they’ve had to travel to Avon or Broadripple to find their closest game shops.” The Game Preserve has had a store just about 10 minutes down the street for almost 30 years… Just sayin’. Having said that, this appears to be the largest Game store in Indy by leaps and bounds. Getting ready to move to the NW side, and I will be coming in and checking it out. Billy, while I might have failed to say “Avon, Broadripple, or The Fashion Mall”, the point is none of these areas are on the northwest side. Just sayin’. 2. You guys in Indy are spoiled with awesome game stores when 10 min seems far to go to get some goodies. I’m from the Louisville area where real game stores number less than the number of Super Bowls Indy has hosted. Louisville is populated with tiny fly-by-nights & comics combo stores. The closest reallly well stocked game store to Louisville is in…well…Greenwood, IN (or Lexington). Enjoy your spoils, Indy. I shall be there to join you soon. Oy, I’m glad I’m not down there, then. Then again, I wouldn’t feel bad about not hitting all of the shops to write about them, though!